The latest recipient of funds from the monthly Winesday fundraiser is appreciative of the help. The event, which features a three-course meal with paired wines, raises funds for various community charities, which are then matched by Scotiabank. Funds are raised from ticket sales as well as from a collection sent around at each dinner. Wednesday, the latest beneficiary, the Prince Albert SPCA, was on hand to receive its cheque. 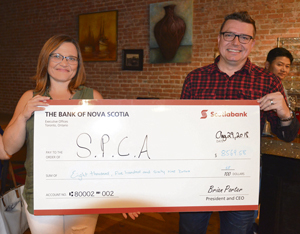 “We’re always very pleased when someone wants to help us out,” said Laura Goodwin, the SPCA shelter manager who accepted the cheque on behalf of the organization. The Winesday funds will pay for vet trips for about a month, whether that’s to spay and neuter animals (about 80 operations could be funded with Wednesday’s donations), or for vaccinations, microchipping or any emergencies. Goodwin said there is so much that goes on at the shelter that most people wouldn’t be aware of that shows the true dedication of the SPCA staff. “Before I started working here last November, I had no idea what went on here,” she said. While the cheque presentation brought about thunderous applause, a second acknowledgement led to a standing ovation. That ovation was for chef Krishna, who bought back Rock Trout Café, where the events have been held, after it closed. The café announced on Facebook earlier this month that Friday would be its last day of operation. Despite the loss of its venue, organizers of Winesday vowed the event would continue.